We make replacement sofa covers for the old, discontinued IKEA Lillberg sofa. Get started with 70+ fabrics & customisations for your custom IKEA fabric slipcover. We cover the Lillberg 3 seater sofa, 2 seater sofa, armchair, sofa bed and others. 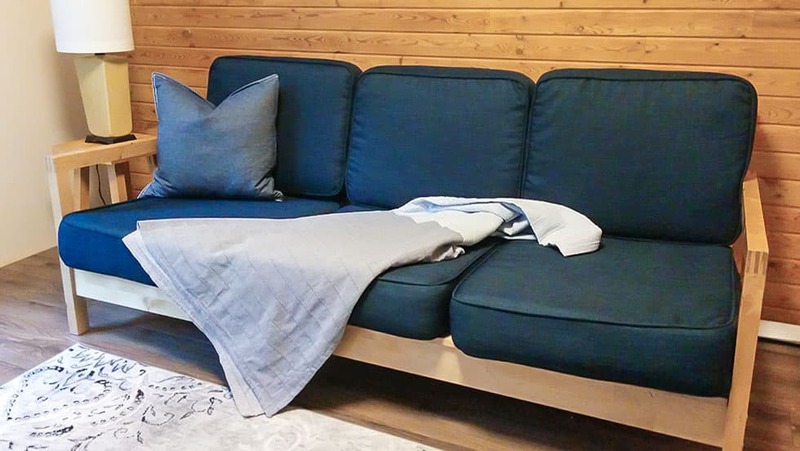 Each Lillberg sofa cover set over US$150 ships worldwide for free! The great thing about the Lillberg cushions is that they are ALL the same size regardless of whether it is on the armchair, rocker, the 2 seater, or the 3 seater sofa. If you have the sofa bed, note that they aren’t interchangeable with the other sizes. Need design advice? We'd recommend strong solid colours and to give it a very classic look, our Urbanskin/Modena (Bycast leather) would make a bold statement. Tufting optional, but worth the aesthetic investment. Give your discontinued IKEA Lillberg sofa new life with our beautifully handmade sofa slipcovers. Pick from over 70 gorgeous fabrics, including linens, cottons, velvets and leathers for a fabulously luxurious look minus the dent in your wallet. Then, add your own custom touches with pleated skirts, contrast piping, ribbons and side pockets for a look that's completely unique. Not sure where to start renewing your IKEA Lillberg sofa? Simply order a pack of our fabric samples and we'll hold your virtual hand as we design the perfect cover for you. Save your sofa from ending up in a landfill, and more importantly, mother nature from becoming even more choked up than she already is, thanks to the estimated 2.12 billion of tonnes of waste that we dump into the environment every year. Upcycling your old, worn-out but much-loved IKEA Lillberg sofa is as easy as pushing a few buttons on your computer and adds years of life to it, all while minimizing the mess on mother nature behind you.